Lil Kim - Black Friday (Nicki Minaj Diss)!!! Please tell me that you all have seen this picture of Neffie, Keyshia Cole's sister, new hairstyle. I think she is LOSING with this hairstyle, what do you think? 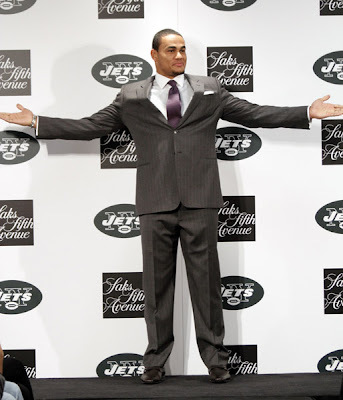 *New Music* T.I. Feat Drake - Poppin' Bottles! 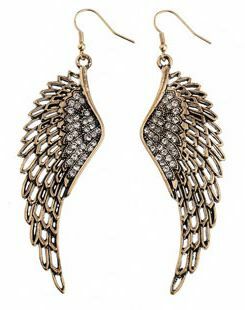 I think these earrings are so cute. Check them out. Do you like? Price - $20. Karl Lagerfeld has received a lot of attention lately especially after the rumors that he might leave Chanel and that he might be replaced by Haider Ackerman. However those who were saddened by the rumors can now rejoice at the thought that we will still get to enjoy the designer's fabulous creations at a more affordable price range. 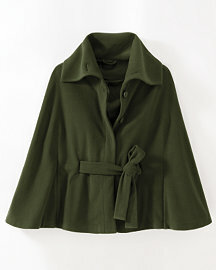 The Valentino Collection For Gap!! To help celebrate an Italian Gap Store Opening, Valentino designed a capsule collection for the company. I have selected some prep style glasses for my Notable guy readers. View the options. Do you like them? Can you yourself in any of them? The ones with texture take the look to the leel from boy yo man. If you are interested in buying or have any questions, contact the Notable Styles Personal Shopper at this link for shopping and price info. Tired Of The Same Old Leggings?!! 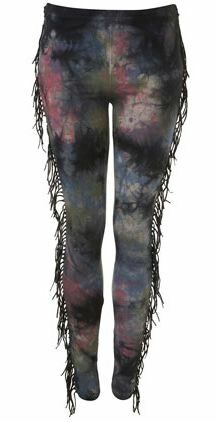 Update your personal leggings collection, with a pair of Topshop, tie dyed, fringed leggings. I like the tie dye on these pants, I think the blending is very crisp and creative. The fringe just gives the pants some extra character. Price - $44!! So would you wear them? For some budget friendly, non-traditional pairing options see below. Let's Play A Game! It's called, Where Would You Wear This? Look at the item above closely. 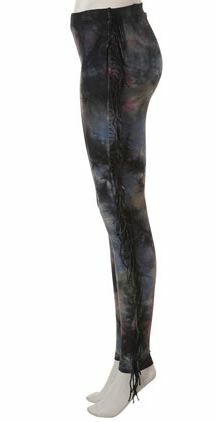 This is an Adrianna Papell (price - $258) glitz and glam mini dress number. Its all bling and not a bit of boring! 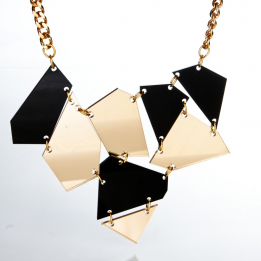 If you could be so kind as to leave, your when and where you would wear this diamond darling in the comments section. 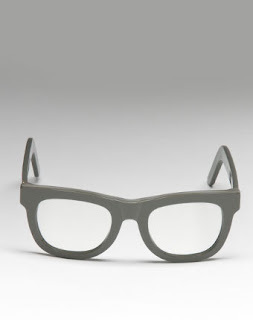 You can even feel free to tell me what shoes and accessories you would pair this with. If you find a look-a-like for cheaper post a link in the comments for your fellow Notable Fashionistas! View the Notable Styles and More Hot or Not images of the day. Make your votes below in the comment section. Each picture is numbered. Have Fun!!! Share this post with your friends!! Jay-Z in Book Signing Mode!! 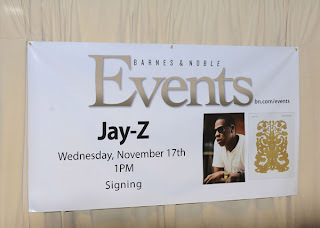 Jay-Z participated in a Barnes & Noble book signing today on 5th Avenue in NYC for his book Decoded. 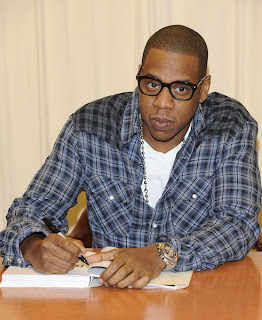 The specs make him look oh so, intellectual...lol!! Nice button up, too! I see the reflective, plaid textile. Good job, June! Click the link to purchase Decoded the hard copy (price $23.33). Click this link to purchase Decoded the NOOKbook/ebook or soft copy (price $28.00). Tell them, Notable Styles and More sent you. 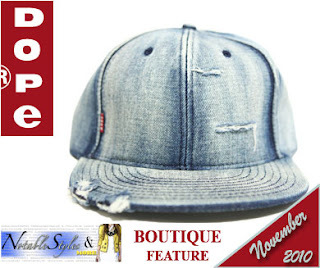 Boutique Feature of the Month: Dope Couture!!! I awarded Dope Couture Shop with the illustrious, Notable Styles and More Boutique of the Month Award for November 2010. If you frequent this blog, you should be fully aware of the shop located in Bloomington, IN that has a nationally renown and celebrity adorned signature brand called "Dope Couture". The Bougie Crew also keeps their shoppers in the What's Hot Now by offering 10.Deep, Rocksmith, G-Shock and more from their in-store and online shop. In the words of Sean Carter, Can I Say "...Seen It All, Done It All...". Here is a link to read my most recent posts about Dope C.
Link in to their webstore and tell your friends about them. The price points are good and they sell both men and womens fashion. They have enough A-1 product to go around, trust me. If you are not afraid to be bold, a trendsetter and fashionable, Dope Couture Boutique is the place for you. Ellis Faas Lights! Liquid to Metallic Eyeshadow!! Ellis created "Lights" that are more than just highlighters. Although liquid, they dry upon application to create the illusion of metallic eyes. Ooooohhhh! The texture appears moist whilst being perfectly dry with a smooth finish, so you won't feel any stickiness and you'll avoid pesky eyelid creases. The Lights are available in five shimmering shades: warm silver, green-gold, bronze, lilac and holographic Bordeaux. I think the colors will be great on, especially for an exciting night out of fun and fashion! You know a party, something like the Costume Couture Party being held November 24th at Cloud 9 Bar and Grill from 6pm - 10pm! Christin Was An Excellent Server! If you ever go to Ruby Tuesday's off of Eagle Creek Parkway in Indianapolis, IN, ask for Christin, she was an outstanding server. Great customer service young lady! Thumbs up!! Behind The Scenes Blueprint Mag Shoot!! Stay tuned for the Blueprint Magazine spread featuring upcoming model Amanda Fields! The set was one colorful place with many stylists, jewelry and accessory providers, one great photographer, an R&B artist and their manager, a record label CEO and of course the Chief Editor of the Blueprint and his staff were present as well. This was a very fun project to work on. So keep an eye out for the photos in the next issue of the magazine!! You are going to absolutely love the work, we all worked together to create! Thank you to my sponsors for supporting the shoot on behalf of Notable Styles and More!! Storytime in Melody Ehsani Land!! 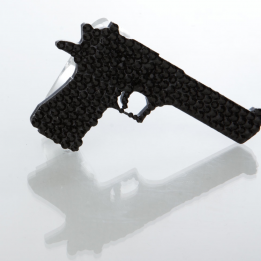 I am aiming and pointing the gun of my ring at all of my goals and pulling the swarovski crystal trigger at them and I will not miss. Beware of the light (if you like the dark) that shines off of my aura, because I am so bright that my light is going to reflect off of this kaleidoscope necklace and brighten your future!! 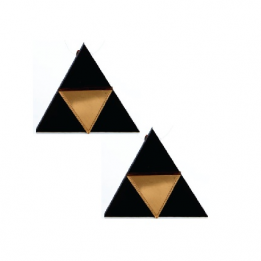 Lastly, when it is all said and done the tri-side earrings, are going to beam me up out of here and I will be gone to my new home. The End of Story 1!! Drake In Vegas At His Concert After Party!! Can someone please let me know what Drake's personal style is or what inspires him when he gets dressed? 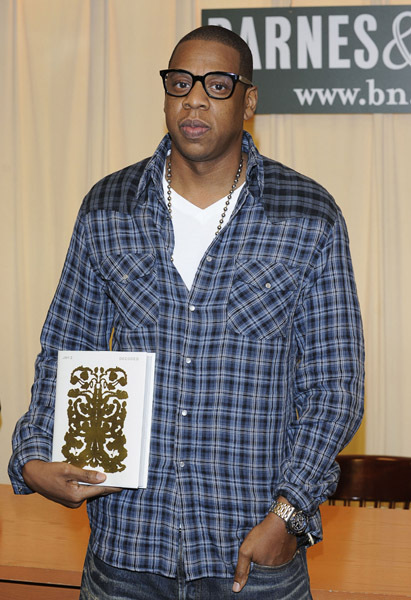 He is the most jeans and t-shirt only wearing rap artist I've seen. He doesn't jazz it up with wildn' out chaines or jewelry. He doesn't throw in a Gucci or Louis V scarf here or there. He's just Drake 100, jeans and t-shirt, holler at me! LOL! In this picture Drake decided to wear a forest green, velvet, over sized blazer ? or track like jacket (cant figure out which one it is) over top of his jeans and t-shirt with boat like boots. Drake keeps it simple, I must admit. Are you down with his style? Why or why not? I Wish Upon A Sea! The other night I had a dream that I had 3 boats to choose from that would drift off into sea with me and my friends. My boat selections were between a 40 ft, 60 ft and a 80 ft cruiser that were all docked and ready to take us where ever our hearts so desired. I decided to do some research on boats to see if my subconscious vision was realistic to the actual size and style of the boats that I saw in my dream. And to my surprise my subconscious was right on point. Below I have attached a photo of a 60 ft, 59 Classic RP for sale, located in Rhode Island, Price - $1.19 mil. This would have been my choice of transport, if I hadn't of woken up. I'll try to re dream it tonight, lol! Swizz Beats To Lecture At NYU!! Superstar producer Swizz Beatz has been named the first Producer in Residence at the Clive Davis Department of Recorded Music at New York University's Tisch School of the Arts. Swizz Beatz, who has produced hits for everyone from Jay-Z and Beyonce to Lil Wayne and Metallica, will guide the students through group lectures, mentoring, one-on-one sessions during the 2011 academic year. Follow the link to read more about this story. Link In To My Zappatos Only Look Book!!! 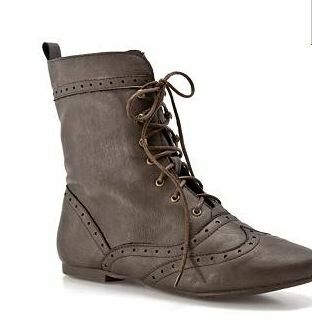 Follow this link to view some shoes that I think are HOT for the season. I hope that you enjoy!!! **New Music** Eminem and Rihanna - Love The Way You Lie Part 2! **New Music** NikkiandRich feat. Loso - City Lights!! Mary J. Blige Looking Fab!!! 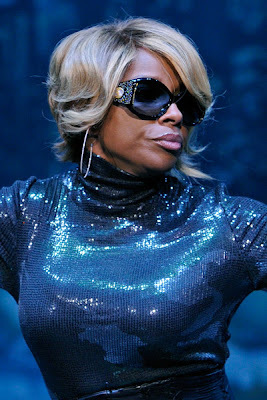 Mary J. performed yesterday in London and looked GREAT, while doing it. I love her catsuit and the wide leather waist cincher. Her boots are always SMOKING and there is no difference here. The sunglasses are a sin they are soo HOT. 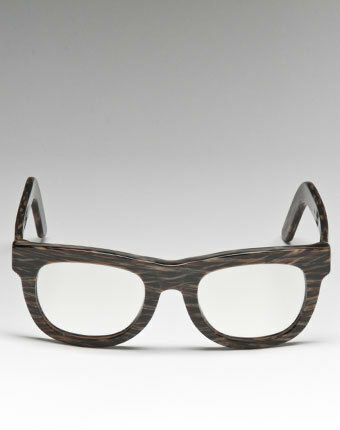 They even look like they may be Versace, ohhh!! Mary J ROCKS!!! Her style is definitely Notable. What do you think? Rihanna and Her New Boyfriend!! 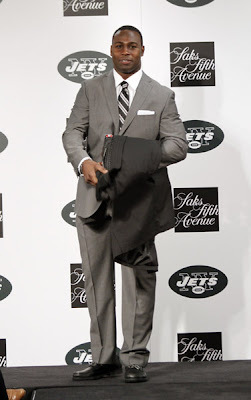 Saks Fifth Avenue Celebrates the New York Jets!!! 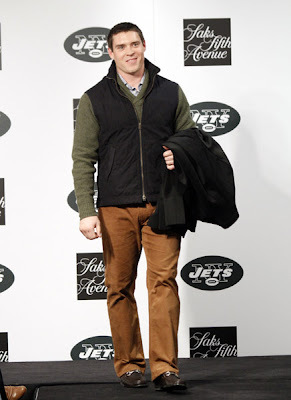 Saks Fifth Avenue celebrated the New York Jets last night and I am almost positive a Saks associate made sure these gentlemen looked very nice for their photogs. Each player pictured below pretty much has their own individual style but the clothes fit very well and does compliment their football player physique. The secret to that is, "shhhhh, tailoring". Some of you other gentlemen and ladies should try it. It works wonders. 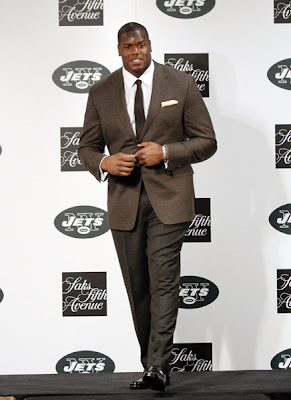 Ladies, how do you rate these gentlemen on style? Are they ready for a date night with you? Please comment. I saw some interesting, creative and scary costumes this Halloween but the costume Anyae is wearing above took the cake for me! She is rocking the Bugsy Siegel look 100%!! The gangsta swag is on point too! But let her tell it her costume was Young Money because she's "young and all about the money!" I said, wow, kids are crazy, lol! Do you like Anyae's costume? Art Institute Indy Fashion Show Review! !